You can help serve, rescue and transform a life, one sandwich at a time. The Mission needs help preparing hundreds of sandwiches every single day of the year. These sandwiches are delivered to the Mission's Search & Rescue vans each evening, where adult volunteers serve the sandwiches to hundreds of people in homelessness throughout the night. The sandwich is often the first gesture of humanity a person in homelessness may have encountered in a very long time-don't ever underestimate the power of simple sandwich! Bring a complete and ready to serve meal for a group of 48 women and children (plus the number of people in your volunteer group) to the EFS. You can help serve, rescue and transform the lives of four-dozen women and children one meal at a time. Your meal preparations and cooking must be completed before coming to EFS. Warming ovens and basic kitchen equipment are available to finalize the serving of the meal. Please do not include pork products in your meal. Location: You can help serve, rescue and transform a life, one meal at a time. Working side-by-side with the Mission's chefs and kitchen staff, you can help prepare and serve meals for 100+ residents and guests, each and every day of the year. Find a day that works for you and your family! Saturday sessions are booked through June 2015 for large groups. Openings for individuals or small families may be available, please check our online volunteer calendar for availability. Weekday volunteers are Food Lifeline's greatest need! Contact: Volunteers can schedule online at www.foodlifeline.civicore.com. Contact Heather or Jennifer at 206.545.6600 for scheduling assistance. The Hunger Intervention Program provides Healthy HIP Packs to local elementary schools, where they are distributed to students who can benefit from extra food over the weekend. The HIP Packs provide healthy meals for these students who might otherwise experience hunger during the weekend when school meals are not available. Come out and join us at our packing parties to help assemble these HIP Packs and help with other volunteer projects. Everyone is welcome, and no training is needed beforehand. RSVP is helpful but not required. Hope to see you there! Many seniors in our community face loneliness every day. You and your family can share the kindness of a personal connection with an older adult. When your family visits a senior you help your children become comfortable with our aging population and bring cheer to those who are isolated and lonely. Regular visits with a senior can help enhance the lives of both the senior you visit and your family. Many programs provide training and ongoing support for volunteers; some will ask for a minimum time commitment, typically at least six months. 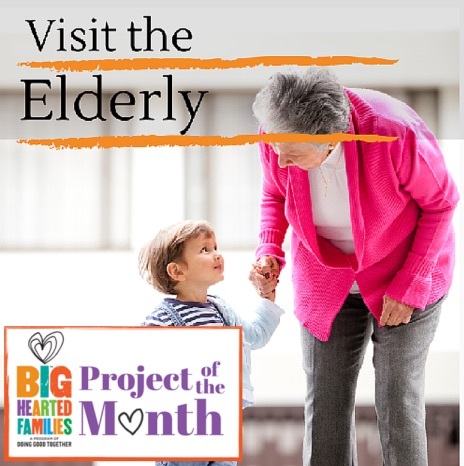 Doing Good Together's Visit the Elderly project page offers lots of suggestions for visiting with seniors, reflection questions for your family and other resources. You can contact a local nursing home, care facility or a Seattle organization that offers senior visiting programs like Full Life Elder Friends or Jewish Family Service. Contact: Full Life, Ginger Seybold, Director of Volunteer Programs, gingers@fulllifecare.org, 206.224.3790.